The ORMUS precipitate is standardized at 20 grams of solids per liter. Different crops and different application methods use different amounts of precipitate per acre. I am assuming that there are 20 drops of precipitate to a milliliter and that there are five milliliters to a teaspoon. 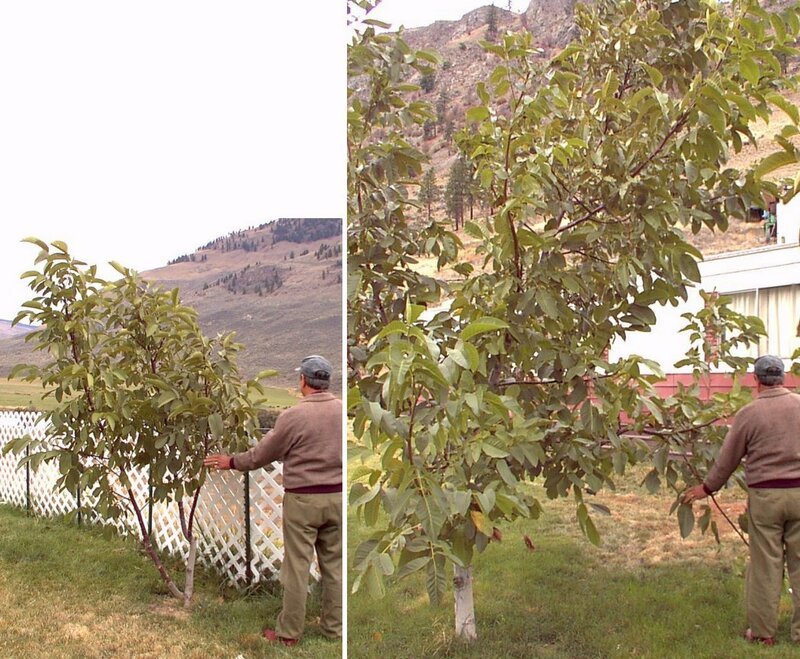 Here are some images of walnut trees and walnuts which were grown using C-11 as a mineral supplement. 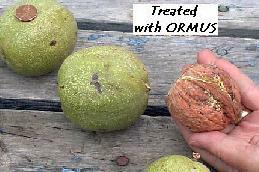 Five walnut trees were purchased from the same nursery at the same time. They were all approximately the same age and size. After it was transplanted, one of these five seedlings was given a dispersion of two cups of reduced salt C-11 from Pacific Ocean water in five gallons of fresh water. The tree which got the C-11 is toward the right in the picture below and one of the trees which got no C-11 is on the left. The smaller tree is about five feet tall and the larger tree is about ten feet tall. These trees all grew in a dry interior climate at around 1000 feet elevation near the 49th parallel. The largest tree received two cups of C-11 precipitate in the first year. The smallest received none. There have been several additional applications of wash water from the third rinsing of precipitate on the large tree. The walnuts on the left are from the trees which did not get the C-11 and the ones on the right are from the largest tree which got the most C-11. The walnuts on the right are approximately 2 1/2 inches in diameter. Notice how much the large tree has grown compared to the picture at the top of this web page. I had a friend stand next to the large tree and the small tree so you can get a better idea of their comparative size. 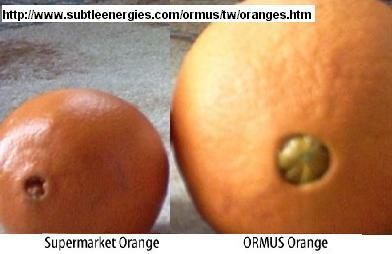 Below is another size comparison between the two year ORMUS orange, the four year ORMUS orange and the small supermarket orange. In this combined picture each of the oranges is in a standard Pyrex one quart measuring cup. Both of the large oranges were grown in Brazil on Great Salt Lake (GSL) precipitate. The small orange was purchased from a supermarket in North Carolina. There are early indications that the plants grown with GSL precipitate are more resistant to insects and disease, have a longer growing season due to frost and drought resistance and genetically engineered seeds appear to revert to their primary genetic component. All of these results are very preliminary and need more study before definitive statements on this can be made. Professor Hou Tian Zhen, the director of the Department of Tree Physiology and Biochemistry at the Xinjiang Academy of Forestry Sciences in the Peoples Republic of China, led a team of researchers evaluating the use of it in three separate experiments. In 1989, the first experiment, conducted in the greenhouse at the An-ning Experiment Station, tomatoes treated with it averaged nearly double the number of flowers per plant and 27% more fruit. In 1990, a field experiment at the An-ning Experiment Station demonstrated that the treated green beans increased yields by 81%, sweet beets yields increased 67%, and soybeans increased 29%. In 1990, a field experiment at the An-ning Experiment Station demonstrated that the treated green beans increased yields by 81%. In 1990, a field experiment at the An-ning Experiment Station demonstrated that the treated sweet beets yields increased 67%. Their blueberry bushes are ready for picking 10-14 days earlier than normal, and their flavor is exceptionally sweet. Cauliflower grown with it are so big that only four will fit in a box designed for 12. It has increased coffee production by over 50%-100%, with better taste, bigger beans, and 80% Fancy or Gourmet quality when environmental stress has caused 80% empty pods on other nearby farms. Young plants yield 1/3 earlier than normal and the harvest is more uniform in maturity so that fewer pickings are necessary. South Australia medicinal herb growers are reporting significant in nutritional and medicinal values for the treated plants. One grower uses the kernel of the black walnut and finds that the active ingredient is four times more potent in treated trees. In the seed room of a palm nursery in Queensland, Australia, some varieties of palm seeds were germinating in 3 ½ months instead of 6. Gabriel Howearth, growing gardens on adobe soil at San Juan Pueble, New Mexico grew a single head of quinoa to ¾ lb, a world record. Normal is 1/5 lb. In 1985 his quinoa crop yielded 700 lb/acre, the normal being 300 lb/acre. In 1987 he produced 1900 lb/acre. BioPhysics Institute,Dana Dudley has provided these testimonials and images. Dana’s main project now is the BioPhysics Institute. Please support the work of the BioPhysics Institute. 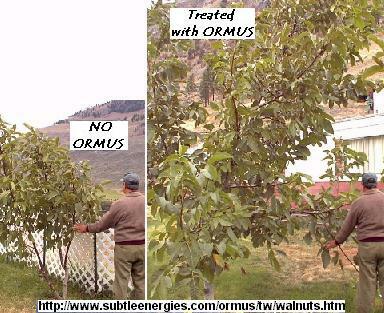 Fri, 20 May 2005, Hi folks, Did a quick and dirty ORMUS trial with plants on my deck. Gave them precipitate three weeks ago, then I’ve watered with trap water since then. The first subject is my rose bush which kinda humdrums from season to season putting out a fair number of good blooms, but the leafage and branch structure has been pretty weak. I put some plant stakes (fertilizer) in the planter last year, but no visible response. This year, I pruned early and new growth began to emerge. Then came ORMUS and everything just shot up. What you see has appeared in only three weeks. You can see the small leaves from last year at the bottom and right in the middle of the picture you see where this year’s growth took off. Note the giant leaves in comparison to modest ones at the bottom, which are typical of all leaves on this plant in the past. The yellow stake supports a really robust shoot, tallest on the plant, that grew out of an old, weak branch. Yesterday I found the entire shoot bent over to the ground from the sheer weight, torquing at the point at which it emerged from the old branch and nearly breaking off. I ORMUSed some of my wife’s herbs. Here’s a picture of 3 weeks of rosemary growth, almost equal in height to to the original plant. New growth is lighter in color, providing a convenient comparison with old growth. Now the strawberry saga. I first planted these about four years ago. They have provided an average of 3-4 strawberries TOTAL per season. Duh. I was going to tear them out this season, but didn’t get around to it. Then three weeks ago I decided to give them some precipitate. Now the one central cluster has more flowers and budding berries than the total output of all the plants over the last 4 years, and I had about twice as many plants as are shown in this picture. Now, I know it sometimes takes a couple of years before a strawberry plant will produce well, but consider this: I have given these plants NO fertilizer this season – only ORMUS. They are twice as tall as the best previous growth (you’ll hae to take my word for it) and the leaves are twice as big on average. Again, this explosion has occurred in just the last three weeks with no fertilizer. Note all the baby stawberries down in there. In past years there were three or four strawberries per year. With ORMUS, this year there are over 90. Hi folks, … Well, I wanted you-all to know that my strawberry plants now have some leaves nearly 9″ across and some of the plants stand 20″ high. Also, the stawberry count was 92 at first report. As of yesterday, I counted 150! I gave them some Sonic Bloom fertilizer a week ago and some regular fertilizer two days ago, and that’s it for this season so far besides the ocean water precipitate on May 3. This chive plant usually does not flower till the end of the summer. These flowers bloomed in mid May. And last but not least is my tiny lettuce trial. The plant on the right is about 50% larger than the other. Guess which one got the ORMUS. I believe that the interrelated problems of peak oil and global warming pose the greatest threat to our modern culture. I also believe that ORMUS has the potential to provide the most significant contribution to solving both of these problems. First: Atmospheric carbon comes from the burning of fossil fuels, deforestation, changes in ocean currents and the melting of the permafrost in arctic regions, among other things. If there was a way to increase carbon sequestration (the binding of carbon in trees, soil, sea water and agricultural plants) this would pull carbon dioxide (one of the largest contributors to global warming) out of the air and lock it up where it no longer works as a greenhouse gas. more than quadrupled in size after being given ORMUS sea water precipitate for four years. These changes in agricultural production should also apply to increases in forest growth if ever ORMUS is applied to entire forests. 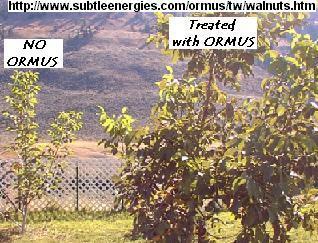 Sea water ORMUS precipitate typically doubles the mass of mycorrhizal fungi in soil within a month after application. Since these fungi are the largest organisms on earth, ORMUS can significantly increase the sequestration of carbon in agricultural and forest soils. Third: Mycorrhizal fungi feed plants by dissolving minerals in the soil and helping to transport these minerals to the plants they are attached to. This reduces the need to add nutrients and fertilizers to the soil. Since these nutrients and fertilizers often come from petroleum sources and must be transported using fossil fuel fed vehicles; reducing the need for fertilizer in half will also significantly reduce the release of carbon into the air. Fifth: Plants that are grown with ORMUS supplements have increased sugar content in both the edible and in the more “woody” inedible portions. This means that they will produce more alcohol per acre if fermented. Add in the burning of biomass, the use of biodiesel and other bioenergy products that would be increased by the greater productivity of ORMUS crops and we should see a significant reduction in the burning of fossil fuels and their contribution to atmospheric carbon. Above are the most accessible and easiest to implement changes that ORMUS might create toward mitigating global warming and disruptions from peak oil but other alternative energy related changes have also been suggested and these might also reduce the production of greenhouse gasses. 1995 I learned about some materials which are difficult to identify using conventional methods but which appear to be essential to many biological systems.We call these materials ORMUS or m-state elements at the suggestion of a couple of their modern discoverers.One of these modern discoverers, a gentleman named David Hudson, has patented some of the ORMUS elements and one process for obtaining them. When he discovered these elements, Hudson was a cotton farmer using conventional agricultural methods but his discovery promises to revolutionize agriculture and biological sciences in general. The biggest problem with Dr. Callahan’s theory is that he has been unable to positively identify all of the elements in the soil which are paramagnetic.I believe that the ORMUS elements are the key to understanding paramagnetic soils.Like the paramagnetic elements in soil the ORMUS elements are difficult to identify using conventional spectroscopic or chemical analysis. In order to explain more of the correlations between paramagnetic soil and the ORMUS elements, it would be helpful for me to explain more about these elements.This explanation is a bit technical but I will try to keep it simple. Certain metallic elements have a non-metallic state with the following theoretical characteristics.We postulate that some or all of their electrons are paired up into what are called “Cooper pairs”.These Cooper paired electrons are not available as valence electrons and therefore do not form molecular bonds.An atom must be able to bond to other atoms of the same element in order to be metallic. Cooper pairing is one of the prerequisites of superconductivity and the ORMUS form of these elements appears to be generally superconductive.Though physicists have been searching in vain for high temperature superconductors, i.e. materials which are superconductive at room temperature and above, biologists have known for a long time that superconductive effects can be observed in living organisms. Cooper pairing and superconductivity are generally considered to be properties associated with Bose-Einstein Condensates or (BECs). BECs are substances which are constituted of many atoms but which behave as if they were a single atom.The common current belief among physicists is that BECs are not stable much above absolute zero or in a superconductive matrix structure.We think that our observations disprove this belief. The Cooper-pairing of the electrons in these atoms or diatoms appears to create a Meissner effect around each atom/diatom unit.This Meissner effect provides a non-local quantum connection between other nearby ORMUS units so that together they exhibit behavior which follows the rules of quantum mechanics.If you have great piles of these monatom/diatom units you can observe quantum physical behavior at classical physics scales. This postulated behavior would account for the observed properties of superconductivity, tunneling, superfluidity and difficulty of spectroscopic identification.Superconductors can exhibit paramagnetic or diamagnetic properties depending on how much energy they are storing. “For several biological systems involving nerve or growth processes the square of the activation energy is a linear function of temperature over a moderate range of physiological temperatures. This behavior may be predicted from the hypothesis that the rate of biological process is controlled by single electron tunneling between micro-regions of superconductivity. We also hypothesize that the ORMUS elements in the tubulin inside microtubules create quantum resonance connections between the cells of all living organisms. Many of these elements are precious metals because in their metallic state they are quite rare.Early research on these elements indicates that they are at least 7000 times more common in the m-state than in the metallic state. So, how well do these properties match up with Dr. Callahan’s paramagnetic soils?Dr. Callahan claims that the paramagnetic soils are best built from volcanic or limestone materials.The m-state elements are most common in volcanic and limestone rock. Paramagnetic soils exhibit paramagnetic properties.The ORMUS elements also exhibit paramagnetic properties.Dr. Callahan claims that the paramagnetic soils help to couple plants to atmospheric electromagnetic energy.The ORMUS elements also appear to provide a superconductive resonance coupling effect inside biological systems. The paramagnetic substances in soil have not been definitely identified.The ORMUS elements cannot be identified using conventional spectroscopic and chemical assay methods. There are several other properties that the paramagnetic soils have in common with the m-state elements.As we explore these correlations we will be able to make more definitive statements about a unified understanding of the relationship between these two classes of materials. It is possible to isolate the m-state elements from rock, air and water using some very simple techniques. (8)I believe that as we integrate the knowledge that has been gained by people who are testing Dr. Callahan’s ideas with the knowledge that we are gaining from our study of the ORMUS elements, we will see a revolution in our understanding of plants and biological systems in general. I have spoken with Dr. Callahan and he is generally quite supportive of the idea that paramagnetic soils get many of their properties from the presence of the ORMUS elements. We have found these ORMUS elements in the earth, air and water. They were collected from air using a magnetic trap at the time of the full moon. They are also present in the water which condenses as dew at the time of the full moon but not in dew collected at other times of the month. The moon appears to generate a tide in the ORMUS elements in ground water which stimulates them to escape into the air at the time of the full moon. I suspect that this same pumping action might assist capillary action in trees and other plants. If this is true then they would be pumped upward in the trees with the water. Dr. Callahan also claims that plant material is generally diamagnetic. (The ORMUS elements become diamagnetic when they are dissolved in water.) He says that wood ash is a particularly good source for paramagnetic elements to build soil. So, it looks like the fact that wood cut at the time of the full moon is more resistant to rot and fire might be explained using alchemy, quantum physics, biology and astrology. If the ORMUS elements are pumped into trees in greater abundance by the tidal/magnetic/gravitational action of the full moon then the increased presence of these elements in wood which is cut at the time of the full moon might make that wood more resistant to fire and rot. The presence of these elements in all of the biological forces involved in soil formation and in soil nutrient availability would promote soil health, tree health and forest health. We have also found that the ORMUS elements modify the properties of water. In personal communications Dr. Callahan claims that paramagnetic soil is capable of storing about 50 percent more water than non-paramagnetic soil. 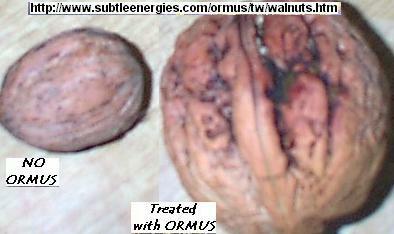 The ORMUS elements are noted for changing the viscosity of water in response to light and electrical stimulation. An increase in viscosity, in particular, might have a profound effect on the ability of soil to store water. It appears that fire and the resulting wood ash are crucial factors for re-paramagnetizing soil. If the paramagnetic ORMUS elements are the crucial meta-nutrients that we suspect that they are, then every manipulation of forest ecology must be examined for its effect on the availability and sequestration of these elements. “Biodynamics is a fairly modern method, originating from a series of lectures given by the spiritual philosopher Rudolph Steiner in 1924. Steiner presented concepts and directions which farmers developed, through their experiments and research, into Biodynamics. The growth of Biodynamics was slow. There was a fear of being misunderstood. Now it is becoming more open. The Biodynamic method is simple. Understanding it is not that important. It is based on the interconnectedness and dependence of the living network. Bio is life and Dynamics is the connections. Well structured soil is incorporated into the ecosystem. The farm is viewed as a living organism. The farmer works towards a closed self-supporting system supplying its own fertilisers through recycling and rotation. The principle methods of biodynamic (BD) agriculture involve burying a mixture of plant, animal and mineral substances in a cow horn for a period of time and taking the resulting substance and mixing it with water by stirring the water one way till a vortex forms then reversing the direction of stirring. This is repeated several times. Timing is a crucial factor in the preparation and application of these BD preparations. I think that the importance of ORMUS in the biodynamic method is very great but understanding how these interactions work is going to take some time and research. In the biodynamic/ORMUS connection I believe that the most important thing to understand is the concept of “quantum coherence”. I define quantum coherence as the ability of certain congregations of quantum scale particles, like atoms, to behave coherently as single atoms. We are familiar with quantum coherent behaviors in the coherent light of lasers and in the behavior of superconductors. Succussion is the process of agitating a freshly diluted solution by rapping its container hard against a hard but elastic object such as a leather-bound book. Hahnemann believed that succussion released dynamic forces from the diluents which were preserved and intensified with subsequent dilutions. The stirring of biodynamic preparations and succussion both create vortices in the liquid medium. “All of the electron pairs in their lowest energy state, unlike single electrons, can exist in the same quantum state. When that uniform quantum state is achieved, the electron pair can not only move with zero resistance around the monoatom, but also can move with zero resistance between identical ORMEs that are within approximately 20 A° or less of each other with no applied voltage potential. When a macro system of high purity, single element ORME achieves long-range quantum electron pair movement, that many-body system according to the present invention is defined as an S-ORME system. In other words, it is important to get a group of ORMUS atoms into close enough proximity in order to have the effect of quantum coherence become evident. I believe that the action of the vortex concentrates these atoms in the center of the vortex. Once they are concentrated, they should start to exhibit quantum coherent behaviors like superconductive magnetic levitation. It looks like this might be the case. The latest confirmation of this comes from Justin Szymanek who has invented a way to use a continuously circulating vortex to “charge” ORMUS rich liquids like grape juice. Dr. Li’s theory got some experimental confirmation in the early 1990s when Eugene E. Podkletnov, a Russian materials scientist then at Tampere University of Technology in Finland, reported that gravity is attenuated above a spinning superconductor. Rotation speeds like this can be achieved in micro vortices with succussion or when reversing the direction of stirring a BD preparation. Once quantum coherence is established in a sample, through what I call “spin coherence”, the coherent system of particles appear to become “entangled” so that changes made on one of these particles are echoed in all of them. This is the “spooky action at a distance” that Einstein suggested might result from certain implications of quantum theory. “During the development phase of the propulsion system it was observed that two separate plasma powered prototypes exhibited identical and simultaneous plasma field discrepancies when operated simultaneously. These simultaneous resonance couplings persisted regardless of the shielding used to separate the two devices, including Faraday cages. We believe that it is possible to build custom plasma field units that are capable of transmitting and receiving messages by resonance-tuning them through the ZPF. In our view, the exchange of information between the devices is accomplished through the medium of the Zero Point Field, and is not dependent in any way on the exchange of conventional electromagnetic energy. Biodynamic principles suggest that a very small amount of information, such as that contained in a biodynamic preparation, is capable of changing the growing behavior of an entire orchard or field. In a similar way, the quantum coherent regions produced by succussion in a homeopathic preparation will carry the information in the source material throughout the water of the remedy and eventually throughout the body of the person who takes the remedy. In essence, the spin coherent ORMUS particles are acting as the carrier for the information in the preparation or remedy. The analogy I like to use is that it acts like the radios in a fleet of taxis. When the dispatcher keys his radio to all of the taxis and tells them to change lanes, they can all change lanes at once. Masaru Emoto, a researcher in Japan has demonstrated that crystal ice formation in water can be influenced by sound, written words, and even by thought. I suspect that the ORMUS elements hiding inside icosahedral water molecules may be the radio in my analogy. When these ORMUS radios receive the command to “change lanes” they put out a resonance that changes the shape of the surrounding water molecule. Thus, using ORMUS rich substances like paramagnetic rock dust can be beneficial but it depends on which ORMUS elements are present in the rock dust, how concentrated they are and how quantum coherent they become in the process of use. There are other factors involved too. I have seen some evidence that a simple paramagnetic rock dust will change its paramagnetic measurements over time due to exposure to certain subtle energies. Here is a report of some observations I made on this on Tue, 25 Mar 200311:20:38 -0700. As an aside, last Sunday we took some muscovite mica (which is often associated with metallic gold and is suspected of containing ORMUS gold) and tested it with one of the Callahan paramagnetism meters sold by Pike. The mica measured +5 or so at first but gradually climbed to +27 over about 20 minutes. Since I suspected that this curve might mirror the paramagnetic to diamagnetic curve I saw in my jumping gold sample I suggested to the people who were in the room that it might go down toward the diamagnetic end of the scale over time. It stopped at +27 for a while and then very gradually dropped to -5. The colleague who has the Pike paramagnetism meter will be replicating this experiment with a video camera on the meter so that we can describe the rising and falling curve of another identical mica sample. Since we parted he has noticed that adding a few grains of the mica to a basalt dust sample will significantly increase the paramagnetic reading of the dust but it too will then significantly decline over time. At first we were concerned that the Pike meter might be drifting so we put a pure basalt sample in a clean 35 millimeter film container to check this out. This sample held rock steady for the entire time. Another colleague has embedded a test tube full of tap water in a bowl of muscovite mica and measured the viscosity of the water in the test tube over time. He noticed that the viscosity dropped at first then started rising. So it looks like the paramagnetic/diamagnetic properties may change over time due to exposure to environmental factors. Plus others have suggested that they may also change due to astrological factors. We are only beginning to develop techniques for identifying the individual ORMUS elements in a substance and are just getting a glimmer of an idea about the many ways in which they can be “charged” or “informed”.